Kumohadamashi Japanese paper, 152 x 170 cm. © Courtesy Franz Gertsch & Skopia art contemporain. In 1971, Franz Gertsch is travelling in the Camargue. He is captivated by gypsy children playing on the beach of Saintes-Maries-de-la-Mer, where they have come on pilgrimage, and takes several pictures of them. Between 1971 and 1972, Gertsch makes three large paintings on canvas based on these photographs. Represented in groups, the children play in the water, attracted by the waves and the powerful rocks among the sand. They draw water from the Mediterranean Sea with a plastic bottle; their legs and arms are wet, reflect the sun and glisten under the clear sky like the foam and the wide shimmering surface of the water. Their looks seem at times fierce, directed towards something outside the picture, at times captured by the playing waves, by the adventure of the landscape. In the painting Saintes-Maries-de-la-Mer II (private collection, USA), one child climbs up the rocks while in the foreground two little girls stand with their backs to the wind, holding an old tin and looking into the distance. The wind ruffles their dark hair and puffs out their summer dresses. 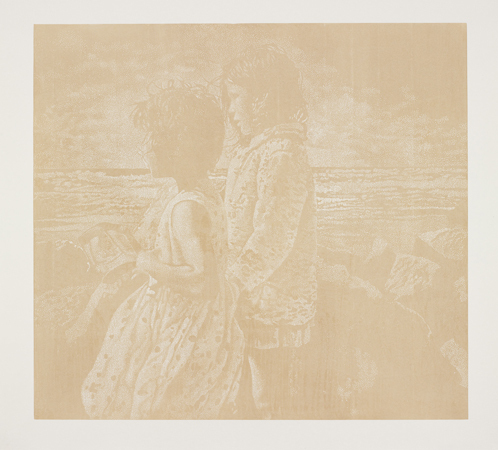 This foreground, these two little girls are the subject of a new series of woodcuts, presented in exclusivity on the occasion of Franz Gertsch’s solo show at Skopia art contemporain. Printed in shades gained from mineral or vegetal pigments, from powders of semi-precious stones or eggshells, these majestic engravings witness Gertsch’s delicate, precise and hypersensitive work and outstanding chromatic scale. Each point carved by the artist’s tool, each segment modulates the light and tames the colour. Franz Gertsch goes back to light as others would go back to their memories. Light is the source of the line, it is the journey, the paradigm, the nature, the deep waters, it preserves the gesture and the time of the artist. Next to the four new engravings of Saintes-Maries-de-la-Mer, Gertsch presents an ensemble of woodcuts in large or even monumental dimensions: Gelber Enzian, Gräser, Pestwurz, Silvia, Schwarzwasser are among the choice of works for this exhibition. Born in 1930, Franz Gertsch is one of the most important Swiss artists today. Since 1969, a year that marked an essential technical and philosophical turning point in his work, Gertsch has developed a prolific and fascinating graphic oeuvre. His exhaustive technical abilities in painting as well as in wood engraving allow him to be free from superfluous stylistic questions and to get to grips with reality, from which he renders an exceptional interpretation. His work has enjoyed international success since 1972 at Kassel’s dOCUMENTA 5, organized by Harald Szeemann and Jean-Christophe Ammann. His works can be found in the permanent collections of numerous European and American institutions, and have been acquired by important private and public collections. In 2002, a museum dedicated to his work opened near Bern. Franz Gertsch lives and works in Rüschegg, in the canton of Bern.